When a terrorist attack brought down New York City’s World Trade Center on September 11, 2001, volunteers from all across the United States stepped forward to help in the midst of a crisis. 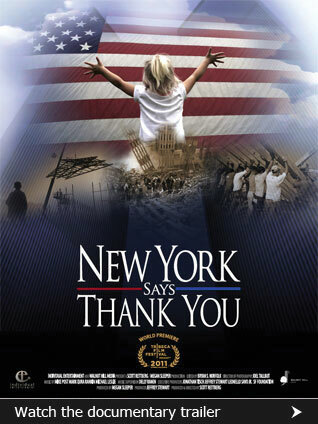 Inspired by the way America came together in a time of need, a group of New York firefighters, construction engineers who helped clear out Ground Zero, and financiers who were based in the WTC have created The New York Says Thank You Foundation. Each year, the NYSTY Foundation travels throughout the United States, bringing relief and construction know-how to communities that have been devastated by disasters both natural and man-made. Filmmaker Scott Rettberg profiles the people behind the NYSTY Foundation, the people they’ve helped, and the communities that have benefited from their generosity in the documentary New York Says Thank You, a film that demonstrates how one of America’s darkest days reminded many Americans of the importance of cooperation and compassion New York Say Thank You was an official selection at the 2011 Tribeca Film Festival.